For two generations of TV viewers, “Burbank” was shorthand for more than just a white-bread city in the San Fernando Valley. It’s meant the studio lot at the corner of Olive and Alameda Avenues, home to NBC’s West Coast operations from 1955 until just a few short weeks ago, when NBC finished packing up its boxes and relocating to the Universal Studios complex a few miles away. 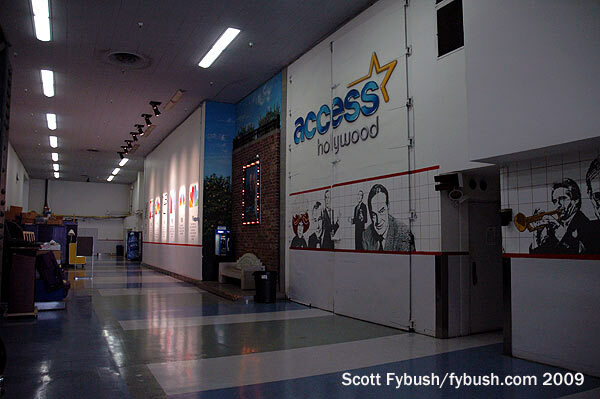 Over the course of several days in 2009 and 2010, your editor had a rare chance to poke around much of the Burbank campus in the company of a friend who worked there, and now that everything you’ll see below is history, it’s probably safe for us to finally share it here on Site of the Week. A bit of history, first? 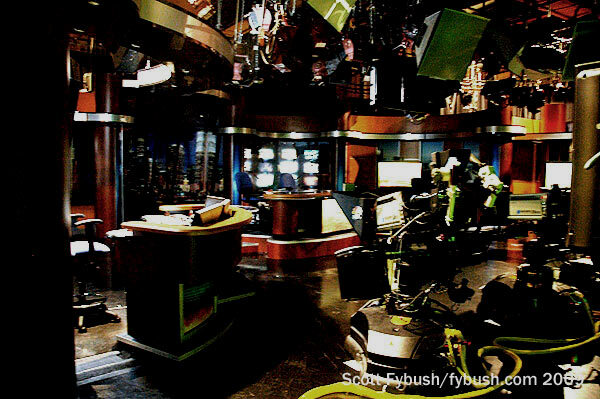 By the time your editor first made it to Burbank for the public NBC Studio Tour back in 1999 or thereabouts, the 48-acre lot included those original studios (designated 1 and 3), two more big studios around the corner (designated 2 and 4), two more big studios in a separate building to the southeast (designated 9 and 11) and several smaller studio spaces built in to the agglomeration of connected structures that cropped up over the years between and around the 1/3 and 2/4 complexes. That mammoth connected mass of buildings that included 1/3 and 2/4 sat, in turn, across a long parking lot (the “midway”) from a three-story administration building, and the whole thing was surrounded by a bunch of out-buildings, including a big warehouse at the back of the property alongside the 134 freeway. When Universal merged into NBC, this lot’s days began to be numbered: Universal came with its own bigger, newer studio lot just a few miles away. By 2008, NBC had sold the facility to a real estate developer, leasing it back until it could move its operations over to Universal Studios. When we visited in 2009 and 2010, the NBC signage was still up and most of NBC’s operations were still happening here; it’s been only in the last year or so that the “NBC” sign on Alameda has been replaced with a new “Burbank Studios” sign and that the Peacock has begun to fold its feathers here. So shall we go for a tour, as it all appeared here a few years back? We start, up above, in the massive hallway that runs behind studios 1 and 3. These studios are each 118 feet long and 89 feet wide, with a warren of little offices and dressing rooms lining a corridor between them and extending into a second-floor space (and a little bit of a third-floor space) up above. When the facility was built, the front wall of the studios was essentially the front wall of the building, facing Alameda; at some point later on (I think the late 1970s), NBC built an addition facing Alameda that provided more control-room space and audience lobbies while replacing the 1950s Moderne facade with a rather bland glass-and-stucco look. 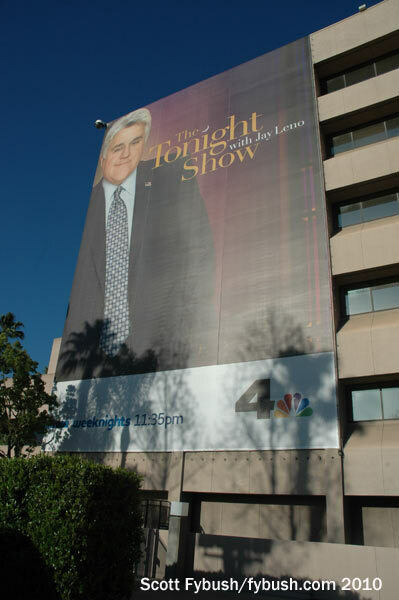 When Leno handed the show to Conan O’Brien in 2009, it relocated to Universal; Leno left Studio 3 to do his 10 PM “Jay Leno Show” in Studio 11 at the back of the lot and stayed there when he reclaimed Tonight a few months later. 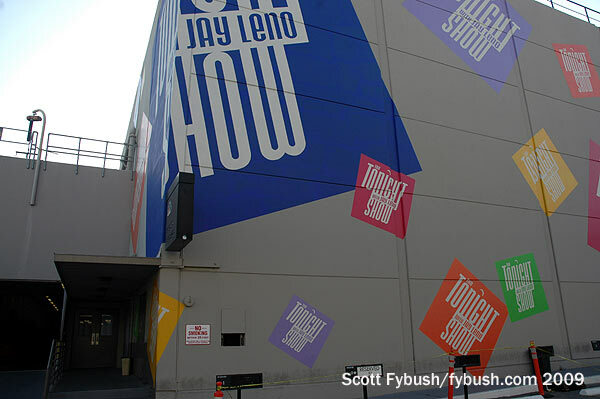 When we visited in 2010, Studio 3 was padlocked and being used for storage, all those “Tonight Show” logos on the outside of the studio facing the midway had been painted over, and the parking spaces where Jay put whatever collector car he was driving had been reassigned to someone else, this being very high-demand parking. Across the midway is the administration building (“Bob Hope Building,” to the new owners), which retains its beige 1960s appearance along this side, though its narrow facade on Alameda Avenue was redone to match the generic 1980s stucco of the 1/3 complex. This is where the biggest of the NBC bigwigs have (well, had) their offices, and it’s home to the commissary and a screening room. We didn’t see much of it on either tour, though we can pass along the story that Johnny Carson used a narrow passageway along a steam tunnel under the midway to get from his office in the 1/3 complex to the administration building when he wanted to avoid people, which was most of the time. If you’re standing between studios 1 and 3 with your back to the hallway that divides them, you’re looking south down several hundred feet of mammoth hallway running the length of the “Fairway Building,” the enormous service complex that fills the “L” between the 1/3 complex and the perpendicular 2/4 complex. 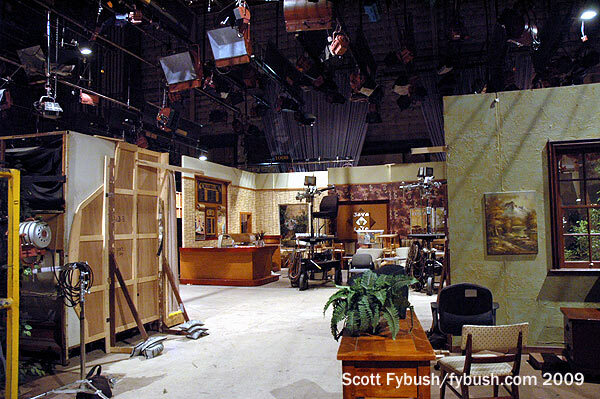 This is where all of the scenery and costumes and makeup departments and craft services for the big studios all happens, and it’s also where two smaller studios have been carved out over the years. 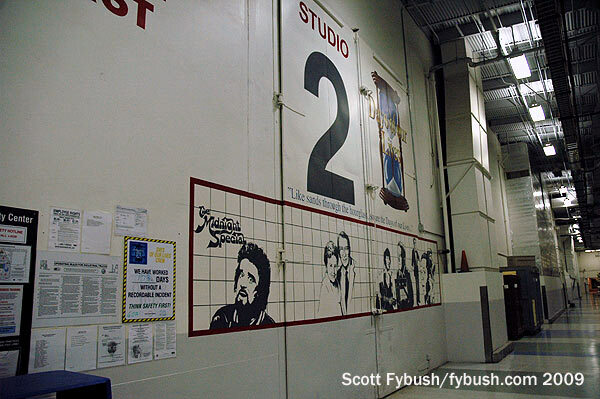 In 1989, 2 and 4 became the permanent home of “Days of Our Lives,” which had earlier been produced at the back of the lot in studio 9. If we were soap fans, we’d have been in a state of giddy excitement at being able to walk around all the many sets that make up the world of Salem; suffice it to say that on shooting days, these two stages and the corridors between them are a hive of excitement as actors and technicians scurry back and forth to make their TV magic happen. I’m pretty sure the control room shown above, at the front of the facility facing the California Street parking lot, has been updated since I saw it in 2009. To the south of the 2/4 studio complex are three small stand-alone buildings known as “the bungalows,” one of which housed the visitor center where the NBC studio tours began until they were cancelled in 2012. If you took one of those tours, you might recall that the area just outside the bungalow where the tour started was full of outdoor sets for those occasions when Days took production outside into the California sunshine. 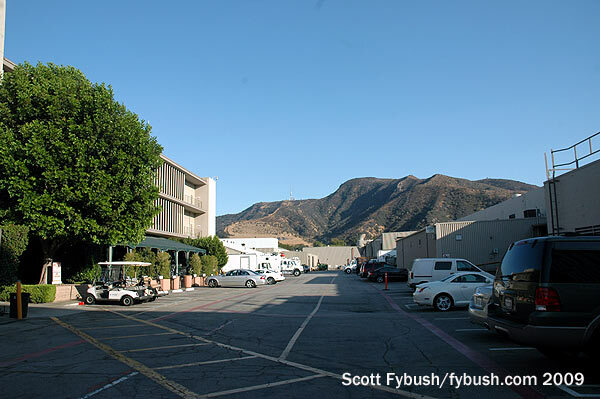 Because Days is produced by an outside entity for NBC, it’s stayed in place here at the Burbank Studios even as the rest of NBC has departed. From here, the official studio tour (at least the one I remember taking) went south down the Fairway Building to spend some time exploring the scenery shop and the huge costume shop. If you’ve seen one big studio scene shop, you get the idea; our tour guide in 2009 and 2010, however, had some other things to show us. Down below the Fairway Building and the 2/4 complex, there’s a basement full of massive HVAC equipment and, down another corridor, the substantial NBC Archive, with shelves upon shelves lined with two-inch and one-inch and 3/4″ tape and film that could keep a TV archivist busy for decades. I assume all that material has been moved to Universal by now; that must have been a fun move to make. Back upstairs, we move into the cluster of small attached buildings that collectively make up the elbow of the “L” between the 2/4 and 1/3 stage complexes, at the northwest corner of the facility. These buildings went up in stages from the 1950s through the 1980s, filling out the angled corner where Olive slices across Alameda and California. 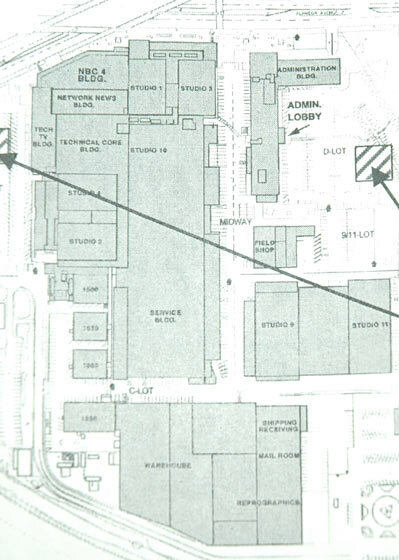 Today, the Burbank Studio developers call the two outer buildings the Alameda Building (the triangular building facing Alameda and Olive next to studio 3) and the California building (facing California next to studio 4); the inner buildings behind them are the Olive and Magnolia buildings. Before we delve deep into those corridors, though, we pay a quick bit of attention to a small studio carved out of part of the Fairway (formerly “Service”) building. 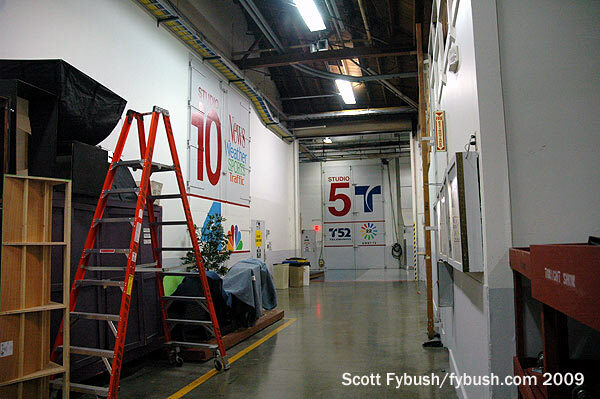 Studio 10 has apparently been renamed Studio 7 by the new owners, but in NBC’s last decades here it was the home of KNBC’s local newscasts, on a small stage that received a bit of an upgrade between my 2009 and 2010 visits. 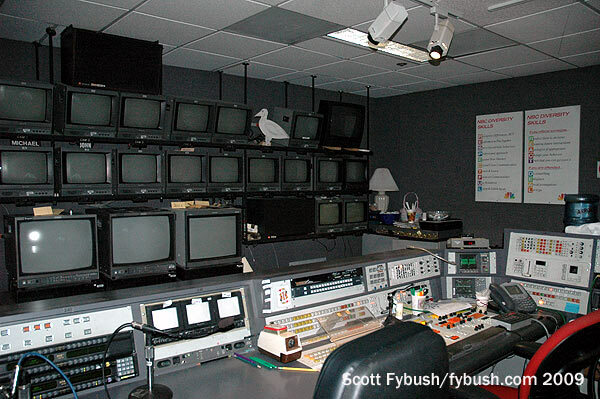 Somewhere along the way, the control room attached to Studio 10 was abandoned and replaced by a new HD control room elsewhere in the complex; my tour guide didn’t work for KNBC and didn’t know where that control room might have been, so that’s one bit of Burbank we didn’t ever get to see. 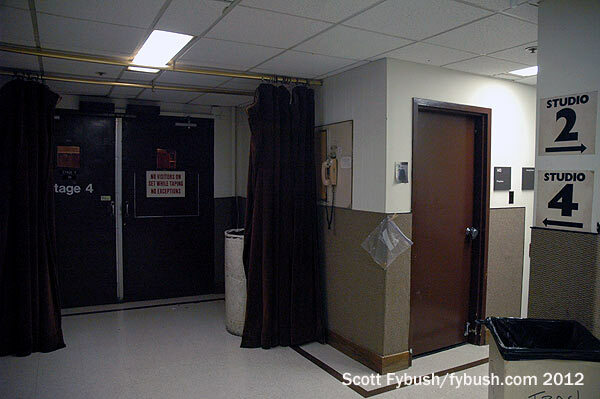 We also never made it inside Studio 5, another small studio that made up part of the “Technical Core” building. 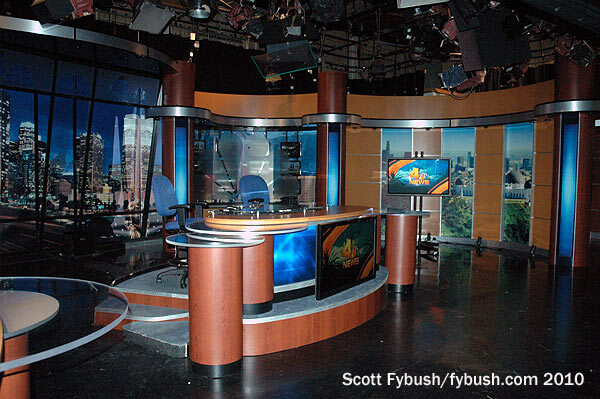 After NBC acquired Telemundo, the local Spanish-language newscasts of KVEA (Channel 52) and independent sister KWHY (Channel 22) occupied that studio, and it seemed to always be in use whenever we were in the building. 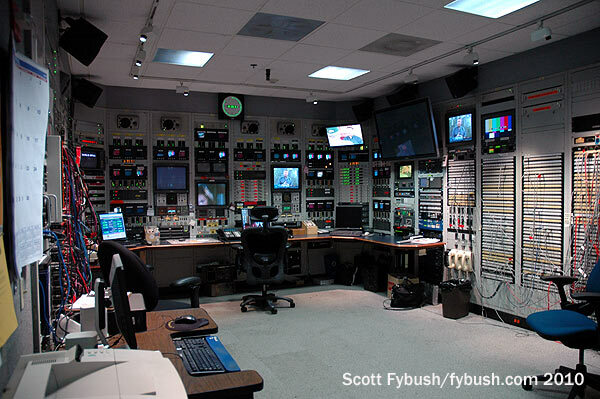 The control room hallway along the front of studio 4 feeds right into the “Tech TV” building, and that’s where the tape room for recording Days was located; it in turn fed into a tangle of rack rooms and technical areas leading to the very core of the technical operation here. 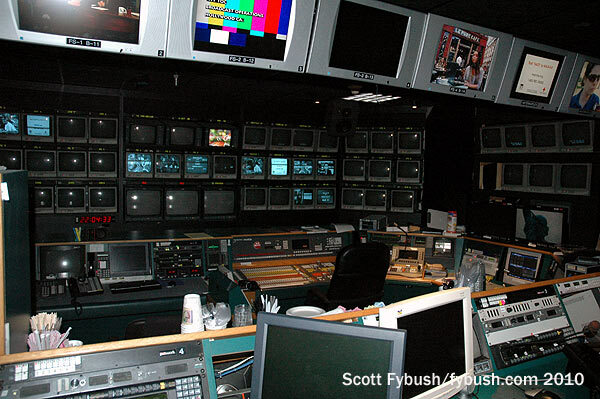 While NBC’s main control room for the network has always been located back east at 30 Rock (currently in the second-floor space that was long home to WNBC radio), the combination of feeds in and out of the building and the need to maintain a live backup for 30 Rock meant a busy master control operation here. 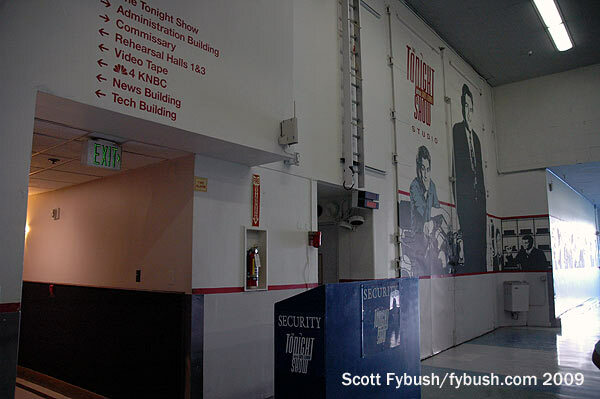 The KNBC building adjoins the “Network News” building, and even if it was never part of the official Studio Tour, you’ll be unsurprised to know that its upper floors were home to NBC News’ Los Angeles bureau. 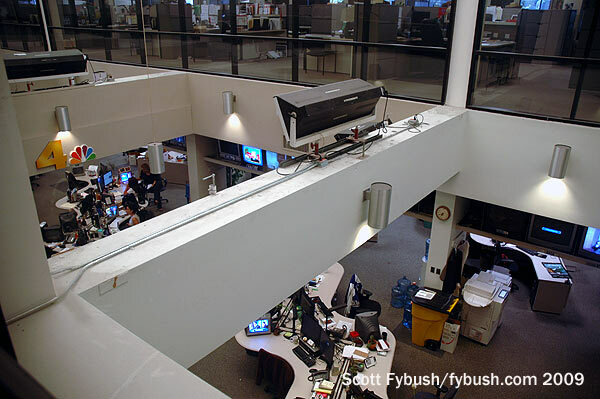 The newsroom was up on the fourth floor, a long narrow space with a studio area at one end and rows of correspondent offices off to the side. 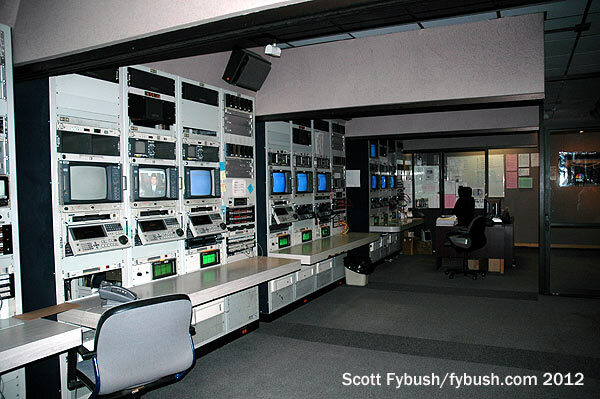 One floor below, a control room handled all the network news origination from this facility, including those occasions when Nightly News anchors were broadcasting from California, as well as times in later years when MSNBC hosts were doing their shows from LA. Those shows usually came from a tiny studio on the third floor just down the hall from the control room; I think this may have been one of the “missing gap” studio numbers in the system here, either 6 or 8. NBC corporate offices occupied much of the adjoining six-story building fronting California Street; my tour didn’t take in most of that space, but I believe it was mostly marketing and promotion people there. 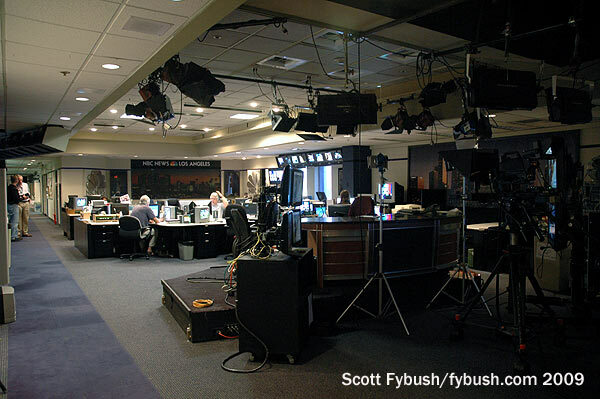 Down in the basement, not shown here, this building included several production suites where most of NBC’s network promotions were carefully crafted. 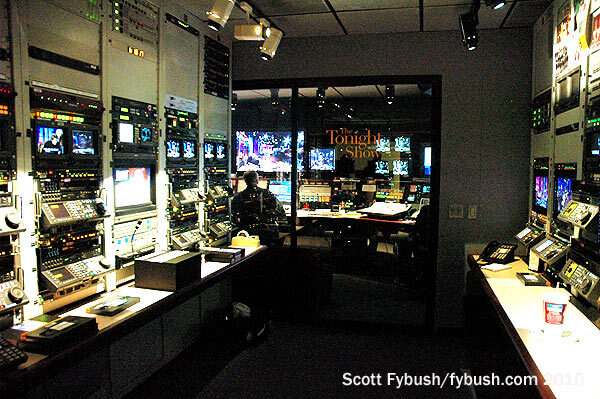 We leave you with a 2004 view of the west side of the lot as seen from the Clear Channel studios across California Street: at left, we see a corner of the angled KNBC building. Next to that is the six-story structure that’s now the “California Building,” and a corner of the Network News building can be seen behind it, with the roofs of studios 3 and 1 beyond that. Those are the big hulks of stages 4 and 2 at center, and at right the bungalows (and the now-gone Studio Tour sign) are shaded by trees, with the lot’s electrical substation in the foreground. 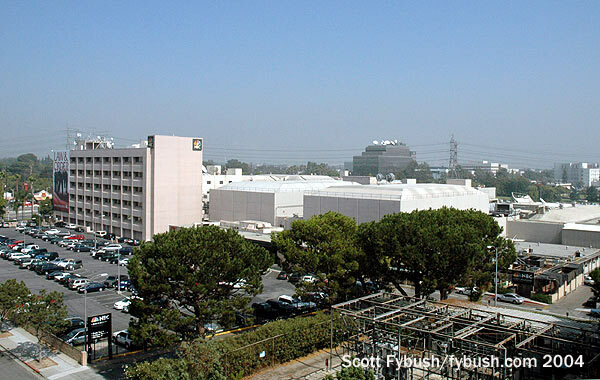 Part of the lot’s zoning arrangement with Burbank requires the new owners to lease only to media-related tenants, so even with NBC’s departure this facility will remain an active media lot. Studio 3, which was so sadly padlocked when we saw it in 2010, has now been leased to Clear Channel, which is originating much of its iHeartRadio video production here. And the new owners have ambitious plans to put up four more big soundstages: Stages 6 and 8 will replace the bungalows to the south of 2 and 4, while new Stages 10 and 12 will be built on what’s now the parking lot west of the administration (“Hope”) building off Bob Hope Drive. The developers are also planning four big office buildings to line the south side of the lot, replacing the huge warehouse and several parking lots along the 134 freeway. 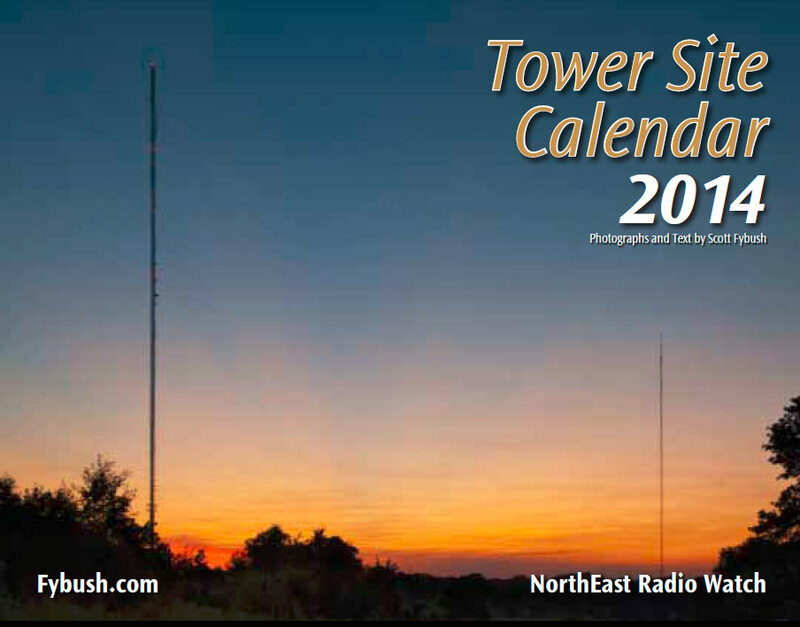 The 2014 Tower Site Calendar has been years in the making. But the wait is over. The Tower Site Calendar, 2014 edition, is still shipping daily and ready for immediate hanging on your wall. Need a calendar or two? Place your order today and we’ll send them right off to their loving homes, spiral bound, shrink wrapped and best of all, with a convenient hole for hanging! This year’s gorgeous electronic pinups include the iconic towers of Catalina Island, a combiner system in St. Louis, the twin towers of KNRS in Salt Lake City, a historic rooftop site in Jamestown, New York and many more! Click here to order your new calendar! Then check out our store page for our other great merchandise, including the last-ever FM Atlas, the new NRC AM Log and a model of the KSAN tower. And don’t miss a big batch of Southern California IDs next Wednesday, over at our sister site, TopHour.com! Great pics and info. I have been to two tapings of Jay Leno, most recently last October, and previously in May 2011. 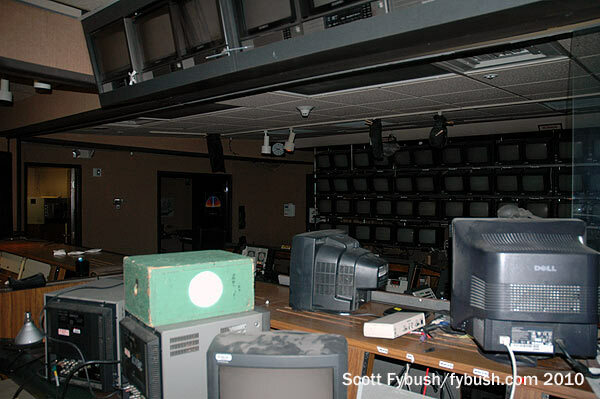 I didn’t see much of the rest of the complex, but was fascinated by what we were allowed to see inside the studios. 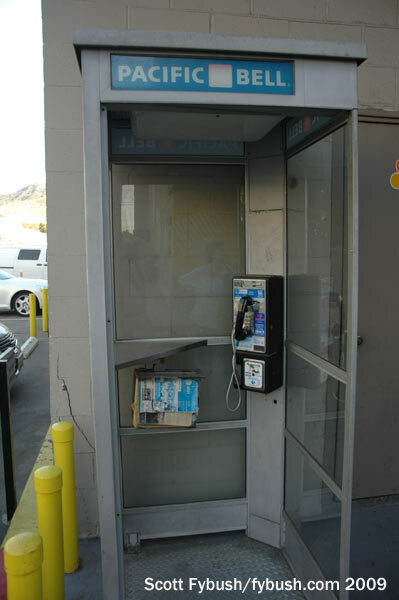 When I took the NBC Burbank tour in July 2001, Jay Leno was on vacation and studio 3 was closed as a new set was being constructed so unfortunetly I didn’t get to see his studio or a “Tonight Show” taping. 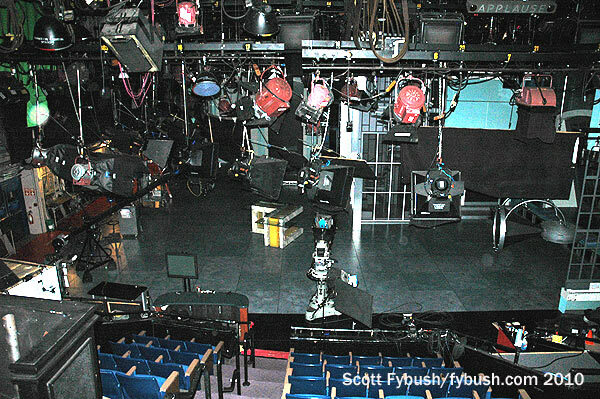 Studio 1 at that time was being used for the game show “The Weakest Link”. At least I got to stand in the studio where Johnny Carson spent his last 20 years as the king of late night. Thanks for presenting this, Scott! Nice piece of history!